What's That Slang is a new game where your vocabulary is your best weapon. Do you know 6 different words for "money?" What's That Slang? started out as a fun idea and creative way to exemplify how a person's language, ethnicity, personality, upbringing, & educational differences may be different but unique & equally valuable! We have high faith that this project & concept will receive funding due to its educational aspect, uniqueness, mix of Urban & Non Urban Education, & the laughter it ignites!!! 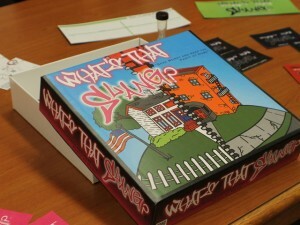 This game is educational and fun for people of all ages, race, & genders!